Interval workouts use a combination of high-intensity activity followed by a low-intensity activity. This combination not only allows you to recover during the low-intensity period, but also enables greater overall conditioning. Interval training is used in many sports, but swimming is a perfect vehicle for interval workouts. This workout method can take your swimming conditioning to a new level. Start every swim, whether focused on interval or drills, with a warm up. It's key to warm up for a few reasons. You need to get your muscles and joints ready for the workout to come. You need to check your form and make sure your technique is pristine. You also need to ensure that your equipment is working properly -- your goggles are on right, your cap won't shift and your suit fits comfortably to avoid distractions. To warm up, start with 12 laps of easy freestyle followed by eight laps of kick using a kickboard to support your upper body. You can use any kick you prefer for a warm up. The goal of an interval workout is to work hard, building your workout to an anaerobic (oxygen depletion) level, then switching to a recovery phase. The best way to do this when swimming is to track your time. Swim all-out for two laps and four laps to see how long that takes. This is your maximum and sets the bar for your intervals. Swim an 8 by100 set of freestyle. This is eight individual sets of four laps, where a lap is 25 yards or meters. This set can be adapted to another stroke, if you prefer. On the odd sets, focus on swimming as fast as you can. On the even sets, swim slowly to recover. Rest for 30 to 45 seconds between each set of 100 yards or meters. Interval training isn't just full-on racing followed by a slow set. You can incorporate drills into an interval workout simply by applying the high-intensity followed by recovery concept to your drills. For a pull interval, use your pull paddles and pull buoy to aid your workout. Swim a 4 by 50 set. This is four individual sets of two laps, where a lap is 25 yards or meters. Focus on swimming with high intensity on the odd sets and swimming slowly to recover on the even sets. Rest for 30 seconds between sets. Focus on your form to ensure you don't overrotate your shoulder and make sure you breathe on each side to avoid injury. To try a kick interval, swim a 6 by 25 set. This is six individual laps of 25 yards or meters. On the odd sets, swim at sprint speed. Recover on the even sets. Give yourself a 15-second rest between sets. Before heading to the hot tub or shower, cool yourself down with four laps of easy freestyle. 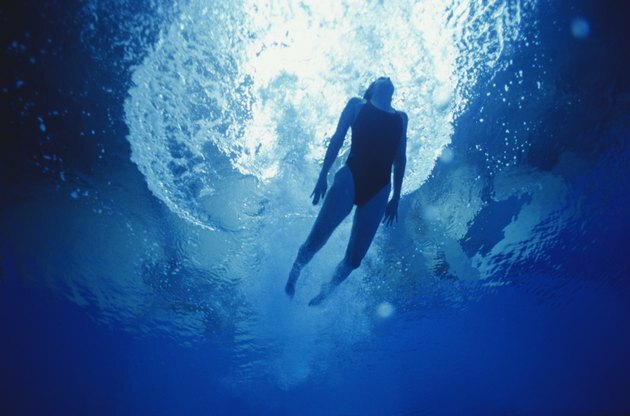 It's critical to cool down after a swimming workout, especially one as intense as an interval workout can be. Your muscles need a chance to elongate after the hard work so that they can recover.